Once again the Portland Art Museum (PAM) in Oregon has delved into its permanent collection to mount an exhibition. This time, the Museum is mining its photographic print archive of approximately 5,000 images produced throughout the 19th and 20th century. The exhibit, titled “Through the Looking Glass: Photography’s Use of Windows, Doorways, and Mirrors,” runs through the end of February 2012 and includes over sixty photographs in which these objects play a dominant role. Termed “Dossier Presentations”, exhibits such as this bring the Museum’s treasures out of the vault and into the galleries, allowing visitors to appreciate the depth of its holdings. These exhibits typically focus on a single aspect of a collection, such as one artist, theme or specific medium. Throughout photography’s 185-year history, windows, doors and mirrors have been used as a visual framework; drawing the eye to what lies beyond a portal, or reflecting objects not directly seen by the viewer. Doors and windows can either be open and inviting, or closed and restricting access. Their use in an image conveys a sense of mystery or perhaps voyeurism. 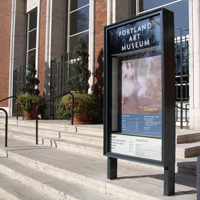 Dolan joined the Portland Art Museum in 2010, filling the void left when the Museum’s first curator of photography, Terry Toedtemeier, died in 2008 after a 23-year tenure. The Museum announced in early December 2011 the receipt of a $2 million gift from an anonymous donor to permanently fund the Curator of Photography position. This brings the number of permanently endowed curatorial positions at the Museum to four, including the European, Asian and Northwest art curators. PAM has the largest permanent photography exhibition space among fine art museums in the region. This latest gift will help ensure that the photographic arts maintain a place of prominence among the Portland Art Museum’s programming. Museum hours are 10:00 AM to 5:00 PM, Tuesday, Wednesday and Saturday; 10:00 AM to 8:00 PM, Thursday and Friday; 12:00 PM to 5:00 PM Sunday. The Museum is closed on Mondays and major holidays. General admission for Adults is $15, Seniors and College Students, $12. Children 17 and under are free. If you can’t afford the ticket, the Museum offers free admission on the fourth Friday of every month from 5:00 p.m. to 8:00 p.m., as well as four free Sundays a year scheduled in conjunction with Museum Family Day.